After a cool summer September arrived warm and very pleasant. And to make it even better I spent the last week of it in Hawaii. I was so looking forward to that vacation that soon after I booked our flight and rented a house I started playing that choosing game in my mind: what perfume should I take with me? I ended up taking with me 12 (twelve) perfumes. And even though some of them were samples I didn’t take any unknown perfumes just for testing: all of them were to wear. Black Vetyver Café by Jo Malone I chose as our shared travel perfume for this trip. Partially it was because I suddenly got tired of the scent that we used on many previous trips (Voyage d’Hermes) but mostly because after reading about it being discontinued I wanted to figure out if I should buy a bottle of it before it completely disappears. I do not love it but I like it enough not to let go just yet. My travel companions from the previous Hawaii vacation – Estee Lauder Bronze Goddess, Ormonde Jayne Tiare and Frangipani had joined me again. So after recently relegated Voyage d’Hermes these three are the best-traveled perfumes in my collection. I still enjoyed Bronze Goddess whereas my reaction to Frangipani and Tiare switched places: I enjoyed the former very much and was surprised that the latter felt somehow off. 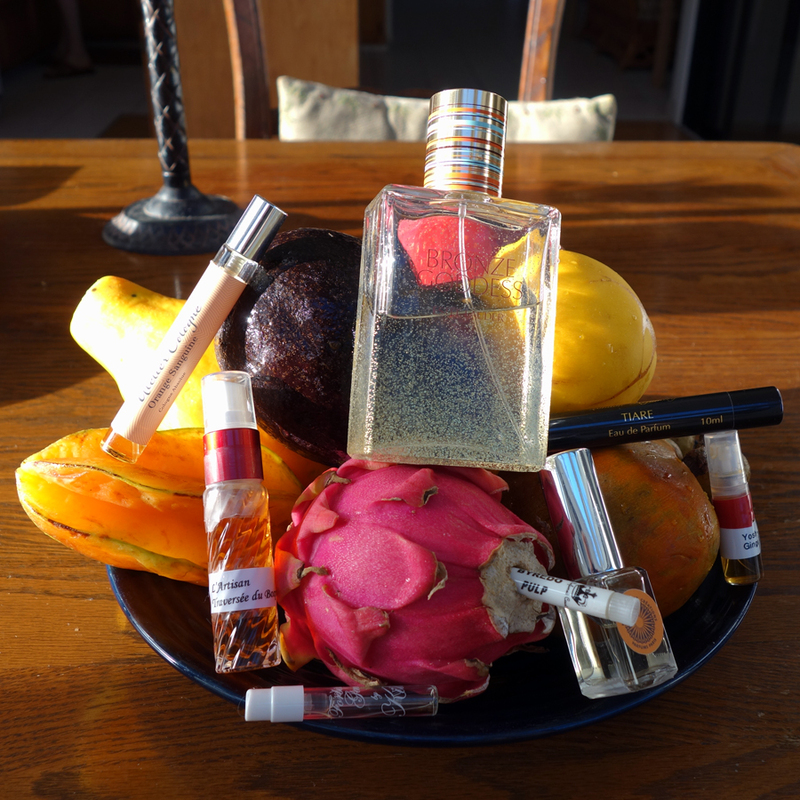 Other perfumes that kept me company on that humid tropical island were: L’Artisan Parfumeur Traversee du Bosphore, Byredo Pulp (I need to get a decant of this one), Yosh Ginger Ciao (Birgit, thank you for the idea), Jo Malone English Pear & Freesia, Neela Vermeire Creations Bombay Bling!, By Kilian Forbidden Games, Atelier Cologne Orange Sanguine and M.Micallef Royal Vintage. The last two were for my vSO but the others nine were all for me. Good thing about hot humid weather and swimming was that I could easily wear 3-4 perfumes in one day. All the perfumes I brought were just perfect for the vacation though, completely unexpectedly, Bombay Bling! wasn’t a fan of that climate: it would disappear from my skin within an hour after the application. It has never happened before in cooler Californian weather. It made me curious how it would behave in, let’s say, Bombay. Any upcoming trips? Anybody? Nineteen (19) people answered my questions naming seventeen (17) of their favorite fruits to eat (13) and to smell (8) in a perfume form. I decided to be strict and if more than one fruit was mentioned I took just the first answer. Mango was an absolute favorite with eleven (11) votes (six (6) for eating it and five (5) for smelling). 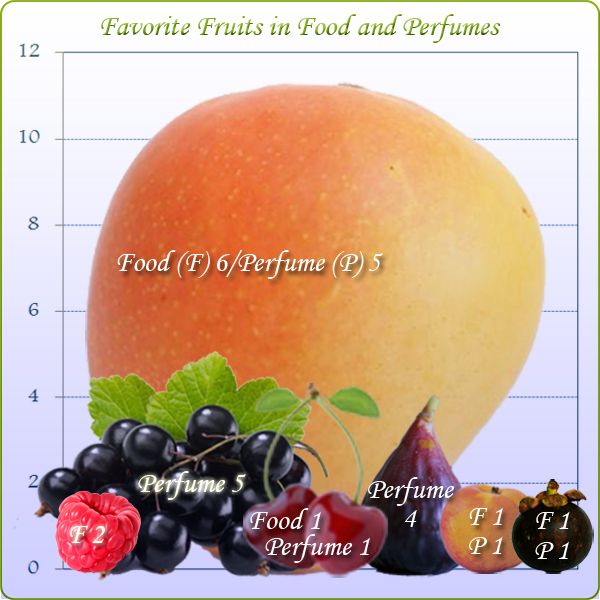 Black currant took the second place with five (5) votes and fig got four (4) votes but both were named only as perfume notes. Mangosteen, peach and cherry got two (2) votes each (one in each category). And raspberry got two (2) votes but both in food designation. All other fruits – durian, loquat, olallieberries, papaya, mandarin, grapefruit, banana, pomeo, plum and grapes – were mentioned just once. Even though I had so many perfumes with me after I came back I kept thinking: “I wish I thought of taking <…> as well” about different perfumes. If you were to recommend one more perfume for me to take on a tropical vacation which one would it be? Le Parfum Denis Durand Couture by M.Micallef. A PR person of M.Micalef brand had contacted me several times in the past offering samples for the review. I truthfully explained that I did not do actual reviews, even for perfumes I liked, if they din’t come with a story – and I never knew when (or even if) I’d think of one. But they still kept sending me samples that didn’t speak to me (even though I liked some of the perfumes). 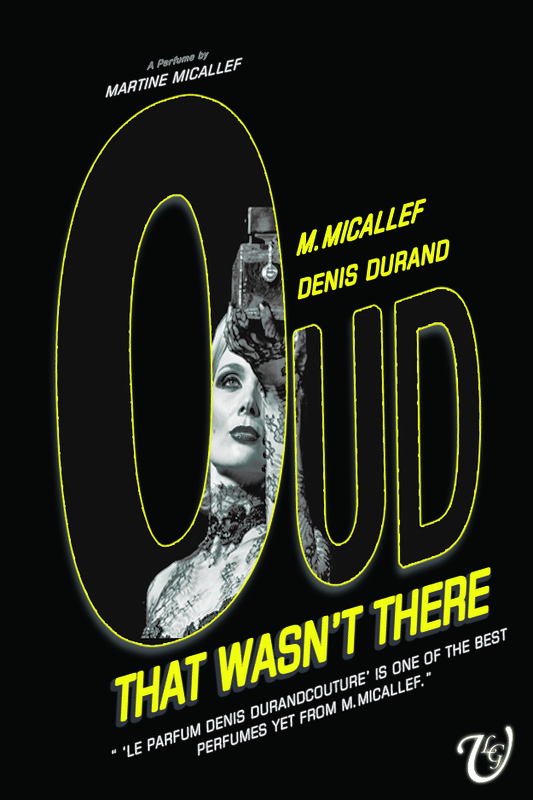 So when they’ve announced M.Micallef’s release of Le Parfum Couture Denis Durand and suggested to contact them for a sample I decided not to – since I felt bad enough not writing anything yet. But I got Le Parfum Denis Durand Couture sample from the company anyway. I avoided reviews that started to appear on the blogs until I could try that perfume (sorry, guys and girls – in case you wondered why I didn’t comment). 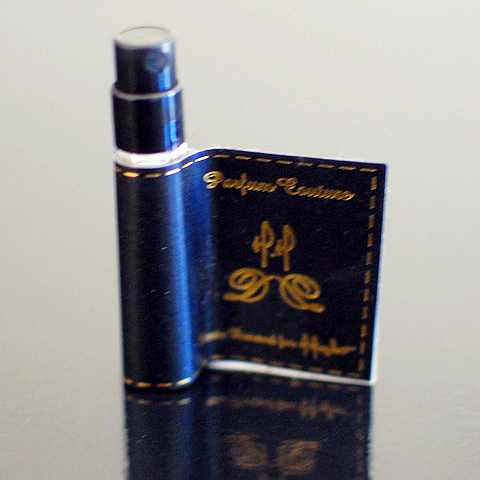 When Le Parfum Couture arrived, I sprayed it, sniffed and told to myself: This is how agarwood perfume should be done! Not too much, not too sweet – just right. How do you feel when you do a blind sniff, clearly smell some note but later find out the perfume doesn’t contain it? Since I don’t think much of my nose I don’t get upset when it happens. I was rather surprised – not as surprised as when I actually get the note right (then I feel both surprised and proud of myself) but still. When I started reading other bloggers’ reviews, I discovered that I wasn’t alone: many reviewers reported smelling agarwood (oud) in Le Parfum Denis Durand Couture. If you haven’t read theories/explanations on what we all smelled in the perfume, I recommend reading the first two links below and choose which explanation works for you. What I want to point out is that for all intents and purposes we can say that Le Parfum Denis Durand Couture has agarwood among its notes. How did I figure? Most modern perfumes do not use real agarwood anyway (as well as many other real notes but it’s a different story) so who’s to say that this aroma chemical or accord is less oud than any other one if we all smell it like such? I wish I could take a picture of Rusty with that beautiful black-laced bottle. Maybe one day I will since I like Le Parfum Denis Durand Couture a lot. But for now I’ll leave you with a picture of a sample vial – one of the 10 that you can win if you live in the U.S. (thanks to Jeffrey Dame at Hypoluxe, an official representative of M.Micallef in the U.S.). To be eligible for the draw all you need to do is to leave a message saying that you live in the U.S. before 11:59PM on Sunday, July 21. You do not have to write anything else (but do not stop yourself if you do have what to say). I’ll choose winners using some random method. Ca Fleure Bon, Now Smell This, That Smell, Kafkaesque, Chemist in the Bottle, The Scented Hound, Perfume Project NW, The French Exit, The Non-Blonde.